This was requested by a member. I'm putting it in Gen Questions, but obviously feel free to pin it or put it wherever it's needed Mods. 2. T25 Torx Head bit or driver. 3. 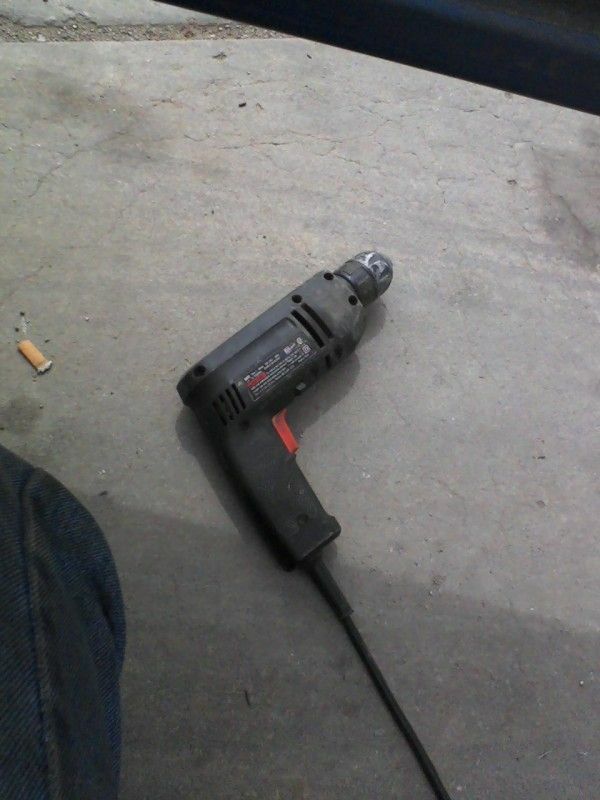 Drill (I highly recommend electric, not battery powered). 5. 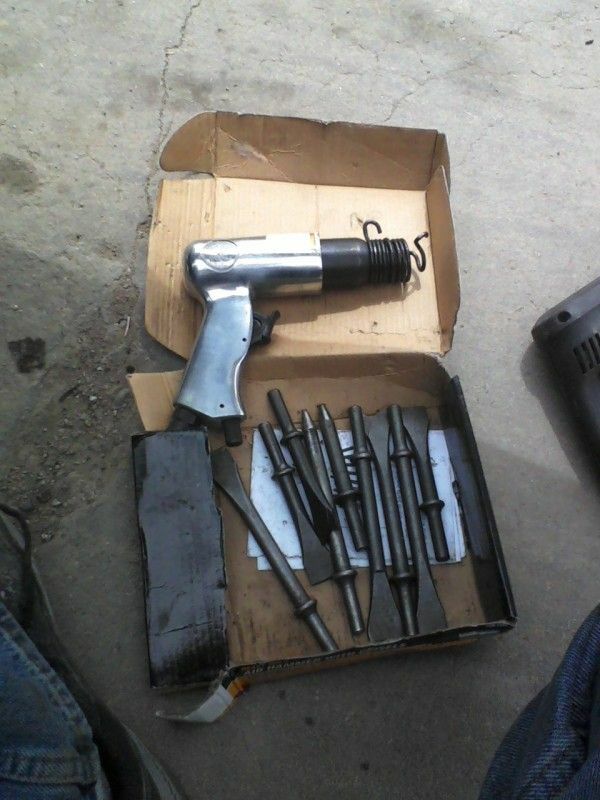 Punch and chisel set (Air powered air hammer is best). 6. 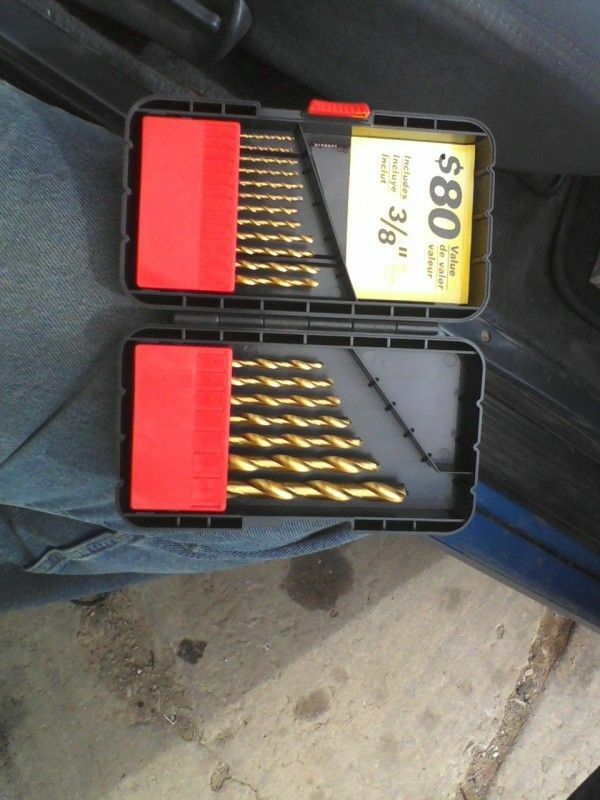 Socket and ratchet set. Step one. 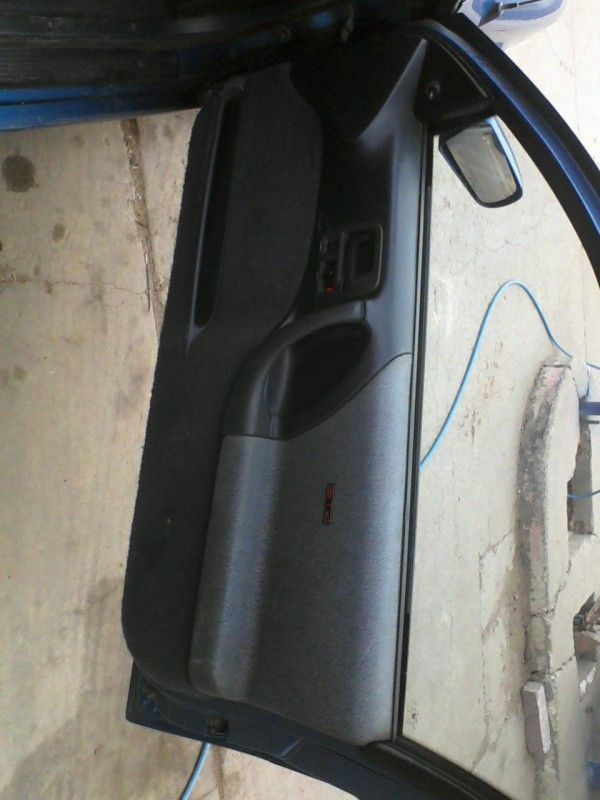 Let's remove the door panel. Now mine is a GTZ, so door panel removal may differ slightly dependent upon year and model. 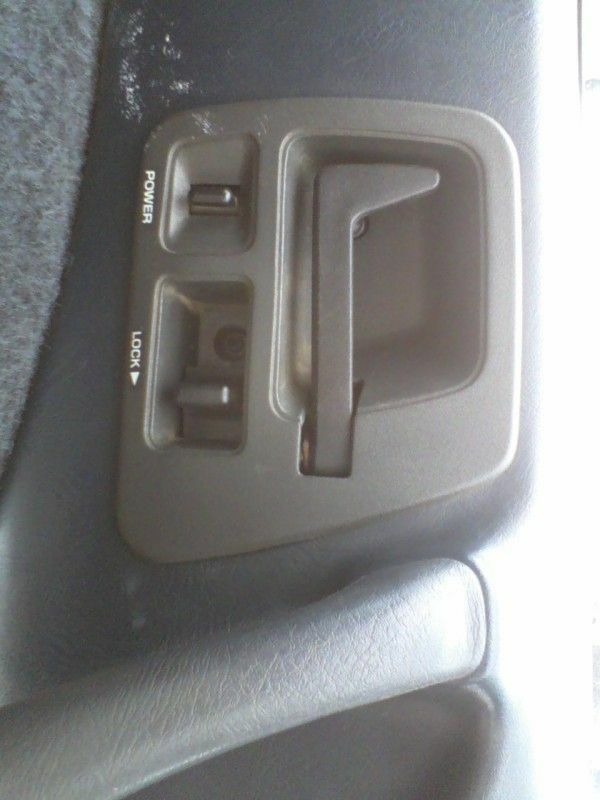 On the GTZ you have two screws for the door handle trim. One is obvious behind the door handle. The other not so obvious behind the lock slide. Both are pictured below. Both are Phillips head. Remove the two screws first and foremost. To remove the door handle trim, you need to open the door handle and then slide the panel over the handle while simultaneously pulling it straight out. You'll then need to pry the lock slide off of the lock rod. It will come rather stiffly, but it will just pop off. Once that's off, twist the trim panel to get it the rest of the way off of the door handle. Remove the electrical connector and set the trim panel aside. Next we have two hidden T25 Torx head screws. One is up and behind where the door handle trim panel was. Pictured below. It's kind of a pita to get out once removed without dropping it , especially if you have big hands like me. 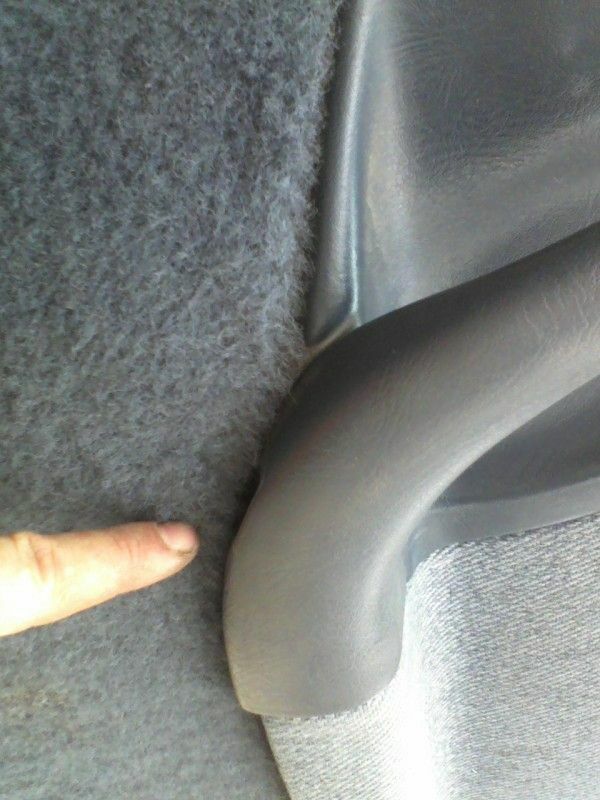 But if you drop it, no biggie, you can grab it after the door panel is off. The second Torx head screw is about twice as long and is located directly under the door handle. It comes out rather easily and without worry of losing it. Pic below. 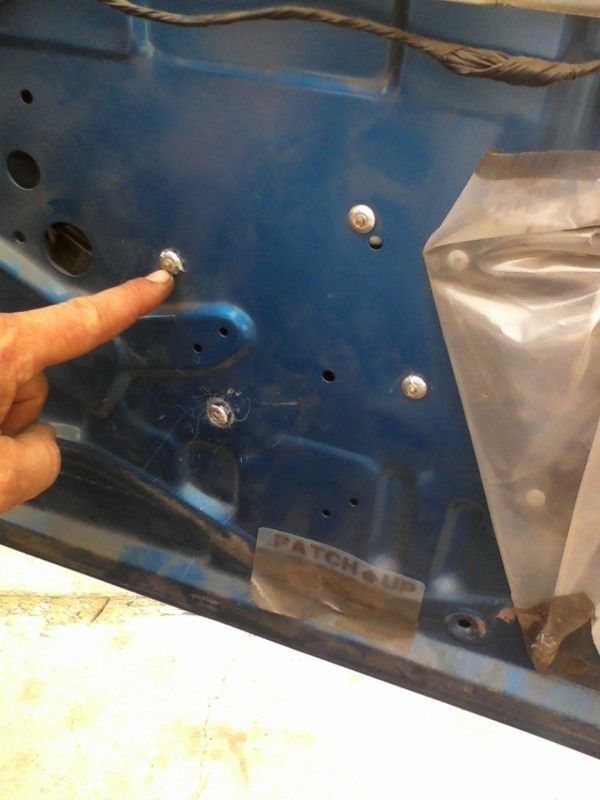 I am pointing to the access hole for the screw. The next step is VERY IMPORTANT! Do NOT proceed without doing this step unless you like replacing windows and vacuuming up broken glass! Ok, enough screaming, just wanted to make sure you got the point. Insert a wedge of some sort (I prefer two for good measure) and/or tape the glass to the door frame with duct tape or equivalently strong tape. The window will need to be in the fully up position from here on out. I used one of the box sides from the Rock Auto box my motors came in. Thanks for the assist RA! You can wedge in the side as I did in the pic below or on the bottom of the window. Side is best in Beretta's. Now, you're ready to remove the door panel. At this point a few stiff jerks should pop it right off , and if you're lucky , get all the xmas tree door clips off still attached to the door panel and unbroken. Next, remove your plastic water shield. Simply pull on it and the silicone holding it on will come with the plastic. Tuck it aside to the back of the door. In the pic below you'll see I'm pointing to 1 of 4 rivets we need to drill out to remove the regulator and motor. 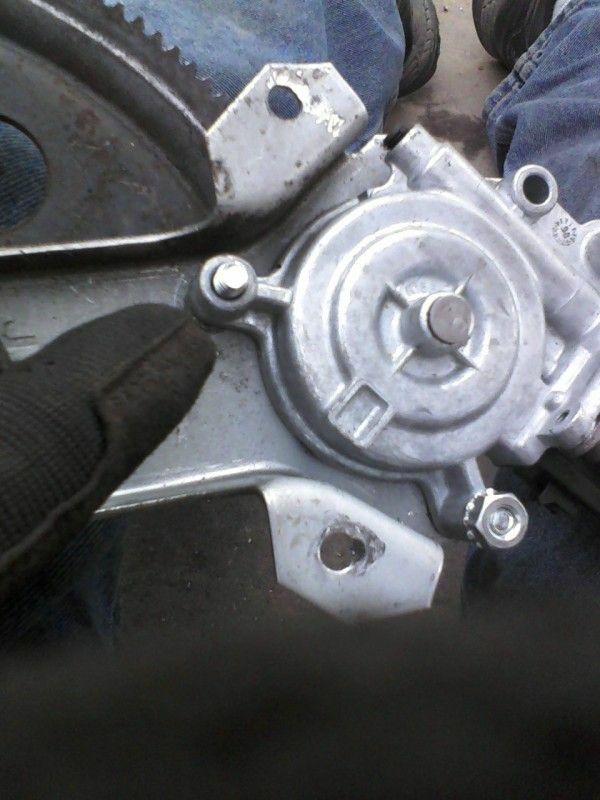 If your motor has been previously replaced , these will already be screws or bolts and you'll have no need to drill. Simply remove them and pull the regulator and motor. For those that need to remove the rivets, read on. The first thing you want to do (if you like things easy) is to take your chisel and "knock" the threaded end off of the rivet to make life easier for drilling. You CAN just start drilling into the end of the stud, but it makes life harder and is definitely more time consuming. Pic below of end knocked off of rivet. 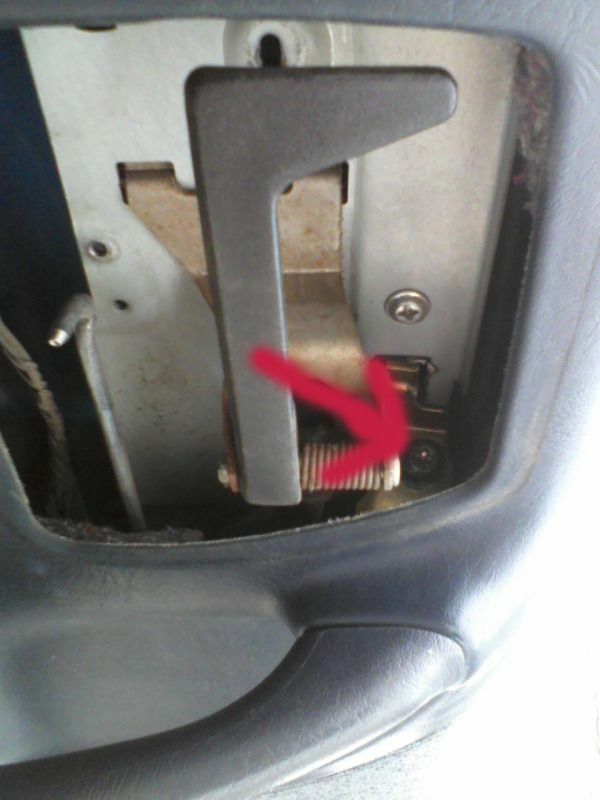 Unplug the window motor before proceeding with this step! 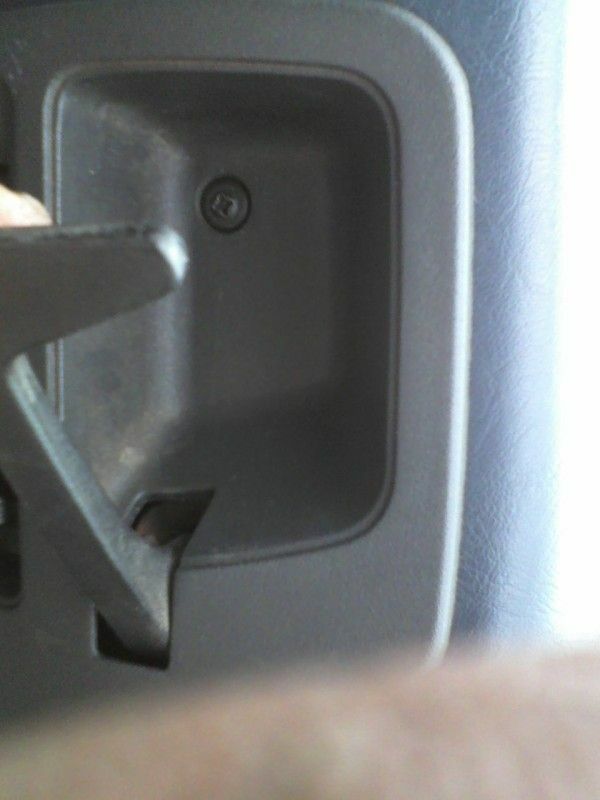 You'll see a quarter size access hole to get to the plug in the door skin. 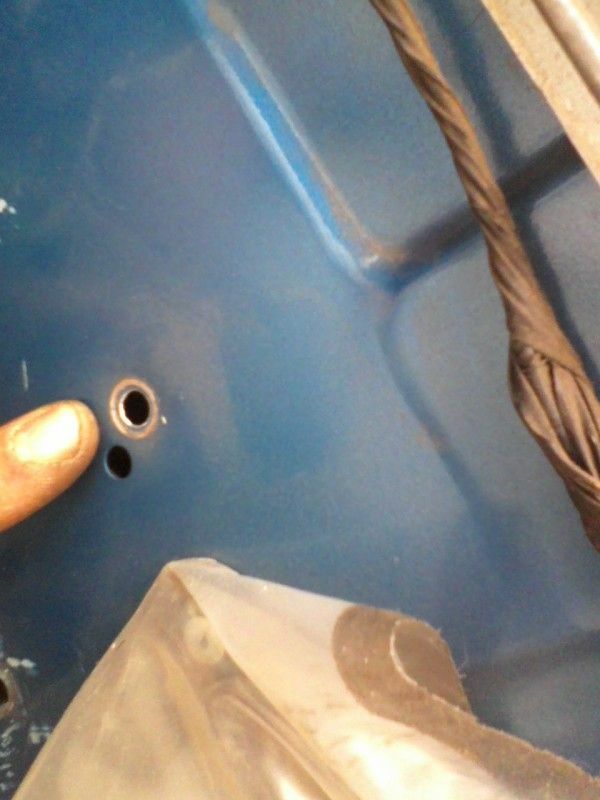 Press down on the tab through the hole and use your other hand from inside the door , lower left hole, to pull it off of the motor. Once you've knocked the end off of the rivet you'll need to drill out the center of the rivet. Start with a bit the size of the stud end you knocked off. I believe mine was 7/32. You then want to work up in drill bit sizes after initially punching all the way through until you've created a big enough hole for the rivet to fall off the back side. I believe I worked up to 1/4 inch bit. 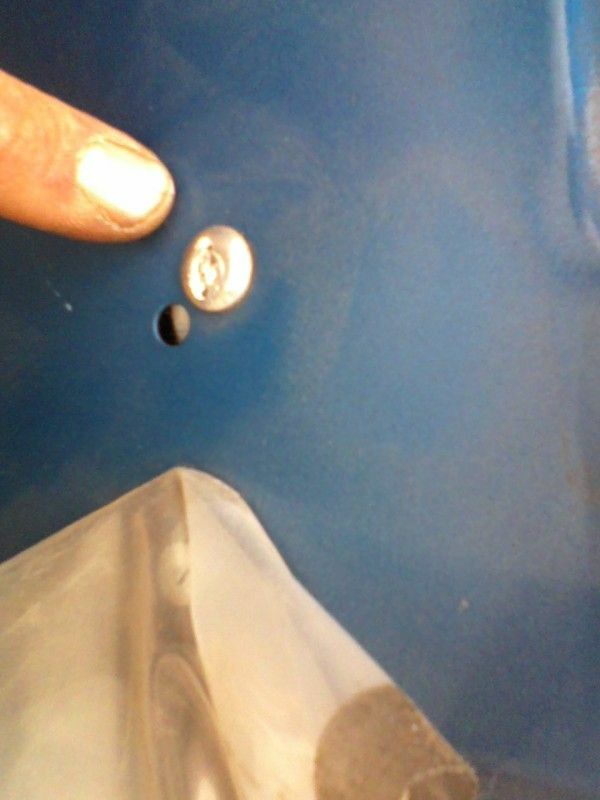 Once you've completed drilling you should have the outer end of the rivet , as in the pic below, and should be able to knock the inner part of the rivet inside the door. Remember to retrieve all pieces later from inside the door unless you want more new rattles in your Beretta. Two pics below. One of drilled out rivet and how it should look when done on the door. 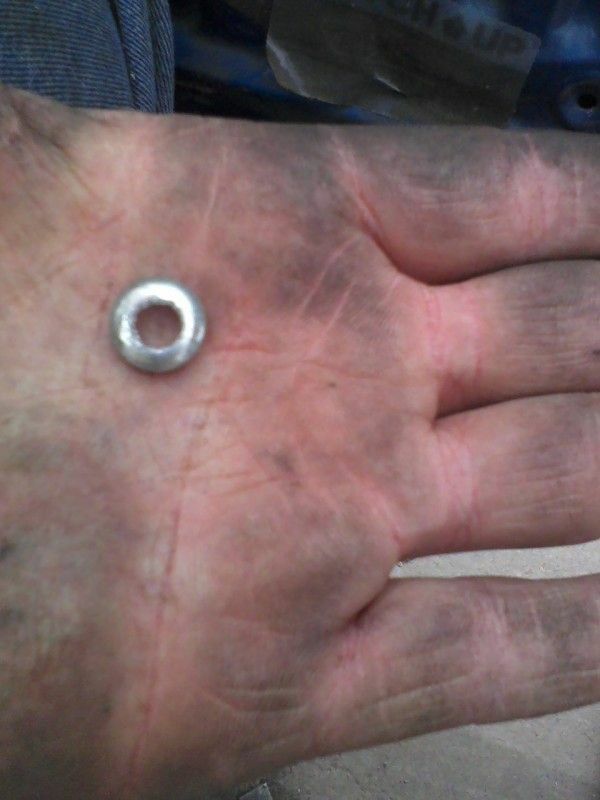 The other is the outer end of the rivet after being drilled out in my hand. Once all four rivets are drilled out (hope you remembered to unplug that motor first as I stated above so it and the regulator didn't give your wiring a nasty jerk!) and the motor and regulator have "fallen down", reach through the door and slide the regulator and motor towards the back of the door in the regulator track. Beretta regulator systems are VERY simple. It's one arm with one attached wheel in a single track. As you slide the assembly to the back of the door, if you reach up in there, you'll feel where it ends and the wheel will slide right out. You then need to remove the assembly through the hole pictured below in the door skin. 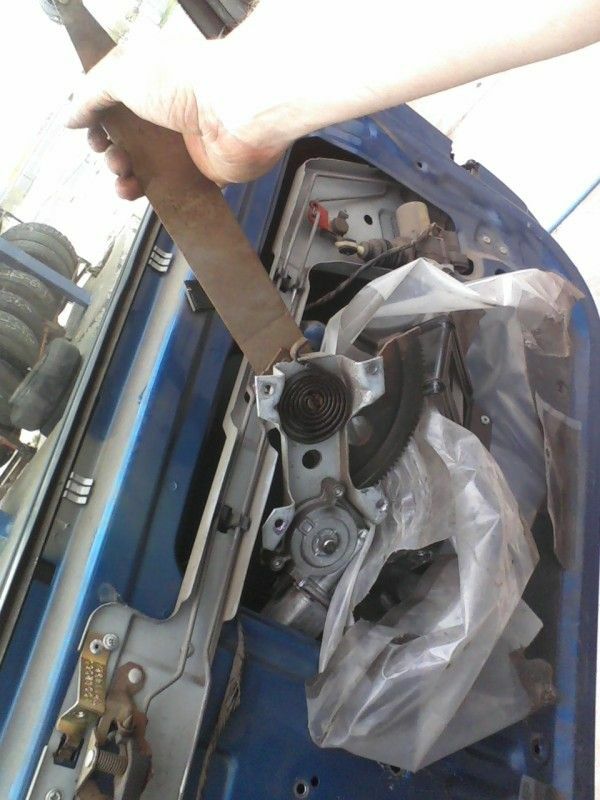 Now, some may want to remove the door lock actuator assembly you can see in the pic. Completely unnecessary step, but if it makes you more comfortable do it. Now that we have the regulator and motor assembly out, we have three more rivets to contend with (God bless moronic engineers....) where the motor is riveted to the assembly. Mark the location of the gear to motor mounting plate with a paint pen or similar from the back (gear side) for later matching up to reinstall the new motor and put the gear in the proper position. Word of forewarning!!! Do the rivet that has it's head hidden between the regulator and motor mounting plate FIRST!! This will allow the regulator gear and mounting plate to let the tension off one another before doing the other two unless you choose to do the stopper option I list below. 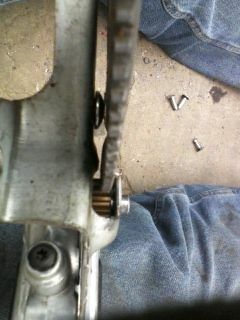 The two shouldn't slide apart until you've removed all three rivets as the motor gear holds the regulator gear in place. However, doing the PITA one first is always my policy. Also, you should be warned that the large counter balance spring (seen in the last pic) has some force to it. You may want to drill a hole into the gear from the back side and into the motor mounting plate to insert a screw or bolt as a stopper. I chose not to and simply marked the location of the old motor to regulator gear for re-installation of the new motor. But I'm a rather large guy, I do this for a living daily , and already knew the dangers and quirks. The spring is generally countered by the weight of the window glass, but (obviously) as we've removed it from there it will want to "spring" forward once all rivets are removed. I just wanted you to have fair warning. Follow the same drilling procedure as the regulator to door skin rivets. Once you have all three rivets drilled out, simply lift the motor straight up for removal. Pic below of rivets (and motor) removed. I'm pointing to one of the three holes, but they're pretty obvious (rivet location) once you get there. Now it gets just a LITTLE tricky for the next bit. Remember the rivet that had it's head trapped between the gear and motor mounting plate? Well, now you have to put that bolt in FIRST and put pressure on the spring after putting the new bolt in that back hole to compress the mounting plate back over the gear making sure the marks you made earlier line up. So, if you used a "stopper" pin, you'll need to remove it keeping FIRM pressure on the gear and regulator arm. Then SLOWLY let the two decompress the spring. Just slowly let up on the two and the spring will "unwind". Put your new motor bolt through the hole and re-compress the regulator and motor mounting plate. Now you're gonna feel like you need three hands and you may need an assistant. After re-compressing the two, you'll need to install the motor onto the bolt and the motor gear will catch the regulator as it goes into place, effectively holding it in position again. 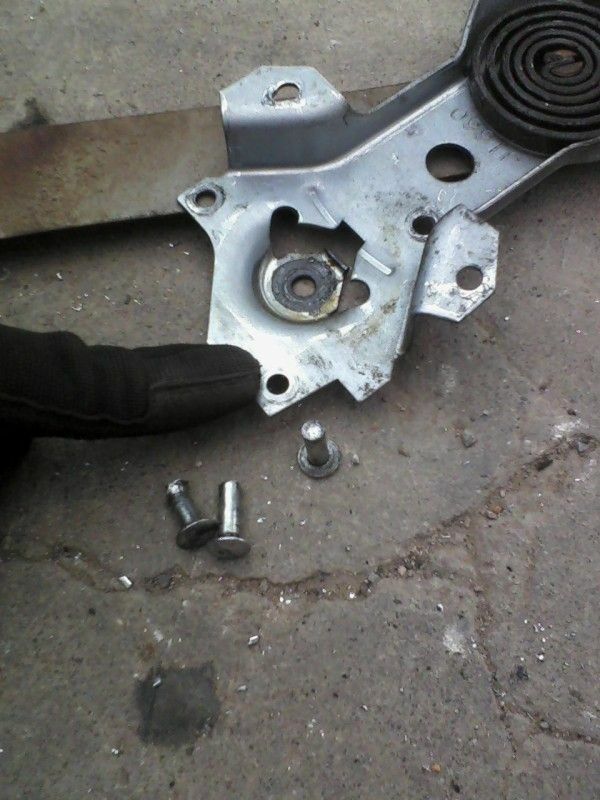 Quickly install your other two bolts and tighten. There tricky part done. Pics below illustrate how the new bolt should look when in position. The first is me pointing to the bolt in question. The second is a shot to show how it looks and is between the regulator gear and motor mounting plate (thereby making it impossible to install or remove without doing it this way) after installation. Next is a pic of the completely reassembled motor and regulator and how yours should look. Now slide your new motor and regulator assembly back in through the same hole you removed it from in the door skin. Make sure the wheel gets into the track properly first, then slide it towards the front of the door and line your rivet holes up with the mounting plate. Insert your new bolts and nuts , snug down. 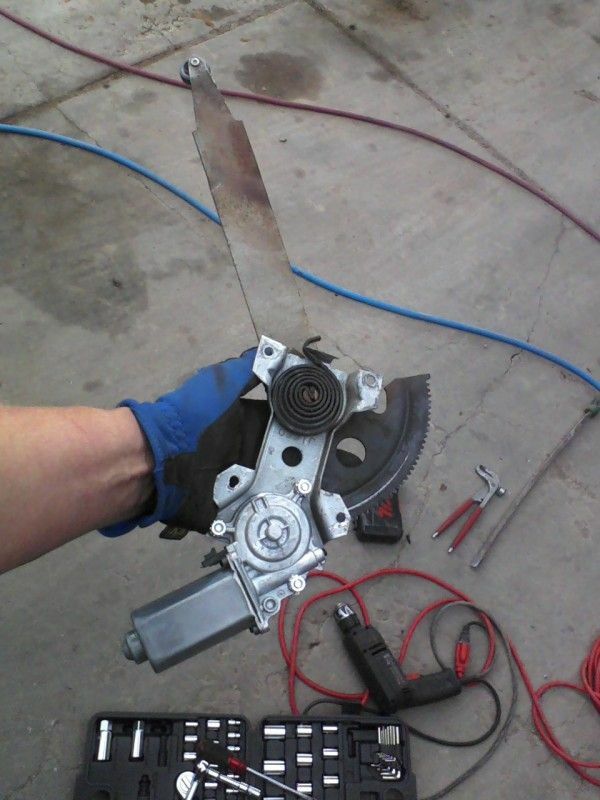 Pic below is what yours should look like, minus the scratches mine had from someone previously attempting to remove my motor/regulator and me slipping once with my air hammer.... Finished product. 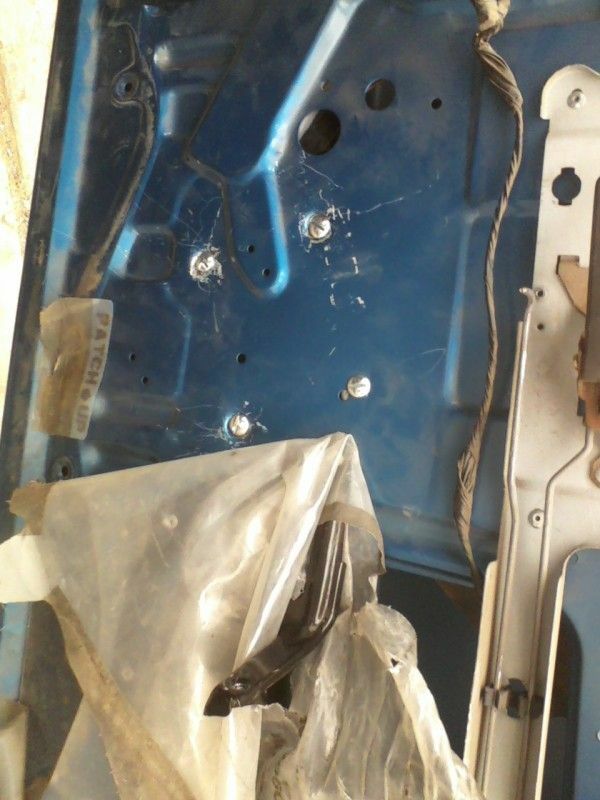 Now reinstall your water shield (the plastic) and your door panel. Installation is reverse of removal. Hopefully this guide is informative and makes life easier for guys new to factory window motor replacement. If you have any questions feel free to PM me. Cool, thanks SGR! Someone sticky this please! It was the spring that put the fear in me. The Chilton's had some strange way of dealing with it. 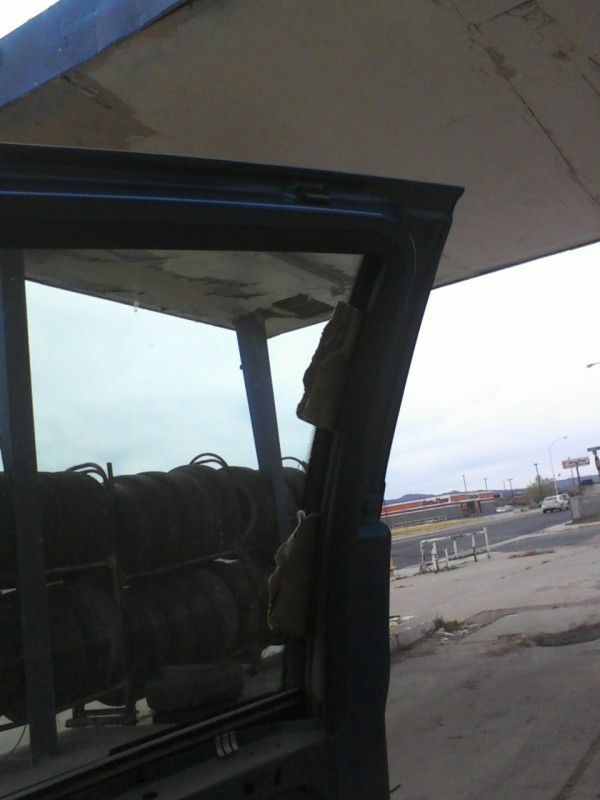 My drivers side window is getting slow going up and down, I might need to do this does not look fun with that spring!